The GiveList is a resource of ways to support communities and causes this holiday season* that don’t necessarily require writing a check. We all know it’s rough out there this year, but that also means that the needs of people and communities are also greater than every. There are a lot of ways that a creative do-gooder can continue to help heal the world. Follow the discussion on Twitter. Isn't this the most fabulous quilt? I saw it chez Dr. Rob. The quilt was created by Ramona Bates, who blogs at Suture for a Living. It is offered in an online silent auction to benefit the Childhood Brain Tumor Foundation. 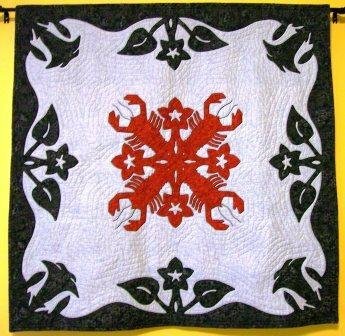 The lobster featured on the center of the quilt is Zippy, who travels around publicizing the foundation and raising money. For you crafty types: How the quilt was created. Progress notes. Done! Los Ayudantes is a tutoring/mentoring program for newly arrived immigrant middle-school students who are learning English as a second language. The program started as a partnership between St. Bede’s Episcopal Church in Menlo Park, community volunteers, and the McKinley Institute of Technology (MIT) a Redwood City middle school. Our mission is to provide these recent immigrant adolescents—one of the at-risk groups in our community—with the academic tools and support for long-term academic success and with the life skills for productive, satisfying futures. It is a well recognized fact that a solid command of the English language is essential to a rewarding life in this country. We offer in-school tutoring and mentoring services and programs provided by a diverse network of community leaders, concerned citizens, and professionals some of whom are immigrants themselves as well as bilingual and bicultural. I've been volunteering for two class periods on Tuesdays. The first period we're in a social-studies classroom, and help kids with writing under the direction of the teacher. Second period we each meet with a small, stable group of kids and work on reading fluency, reading comprehension, and writing. There's another program on Mondays at a different school, working on reading fluency. I'm enjoying it tremendously. Won't you join us? This is an interesting concept: you have a service-learning or philanthropy project at your school. How can you boost student engagement and meet like-minded students elsewhere? The LEAGUE is a school and web-based system for service learning that builds character and empowers young people to "do good" in their community, the nation and the world. Change the world by empowering young people everywhere to get in the game of giving thoughtfully of their time, treasure and talent to make themselves, their community and world a better place. The LEAGUE'S board and advisory commission look impressive. The LEAGUE is also on Facebook and Youtube. It looks promising -- go check it out and get involved. Forge is a program founded by Kjerstin Erickson to provide economic and social support for refugees in Africa. The motto is "Refugees Revitalizing African Communities". On October 17, 2008, Erickson announced: Forge Is In Trouble. They have failed to raise almost 25% of the budgeted amount. Forge changed its impact model, and with it lost an income stream. The first three are errors are interlocking. Essentially, Forge committed to a new model that also decreased fundraising capacity by 50%, and assumed the shortfall would be made up by grants and direct donation through the website. It is possible that the Board of Directors didn't have the depth of experience to guide this decision properly. Erickson's latest post details how Forge will address the crisis. Link: Kiva.org - What We Do. Kiva lets you connect with and loan money to unique small businesses in the developing world. By choosing a business on Kiva.org, you can &quotsponsor a business" and help the world's working poor make great strides towards economic independence. Throughout the course of the loan (usually 6-12 months), you can receive email journal updates from the business you've sponsored. As loans are repaid, you get your loan money back. You know I publish a regular feature on teens killed by alcohol poisoning, and regularly list the foundations established by parents of kids who have died of alcohol poisoning. They are all doing good work -- you could support one of them this holiday season. Gordie Foundation here's the link to the giving page. Article, "Death by Alcohol" on the change in youth culture contributing to these deaths. At BlogHer, Laurie Wright recalls the Thanksgiving day murder of Gail Pumphrey and her three children, David, 12, Meagan, 10, and Brandon 6, by their father. If you memorialize Gail and her children, you could support a domestic violence prevention agency, either nationally or locally. If you live in a middle-income area, the greatness of Boys and Girls Clubs might be flying below your radar. Here's the page to donate to the national organization. Here's the page to find a club in your city or neighborhood. As I was driving today, I was listening to a BBC world news program about solar technology and village lighting in Indonesia, where installed solar panels were not performing as expected due to lack of maintenance. That got me to thinking: put the solar/human powered human lighting into the hands of the individuals or families. So I went looking for projects that supply same to developing countries, specifically LED and/or solar powered, and included ongoing maintenance. to bring affordable, safe, healthy, efficient, and environmentally responsible illumination to people who do not have access to power for adequate lighting. LUTW remains the world’s leader in this endeavour: globally active and setting standards in the field. Through generous support from interested individuals, corporations, host country organizations, international foundations and industrial partners, LUTW has lit up more than 14,000 homes in 42 different countries throughout the developing world from Afghanistan to Zambia.